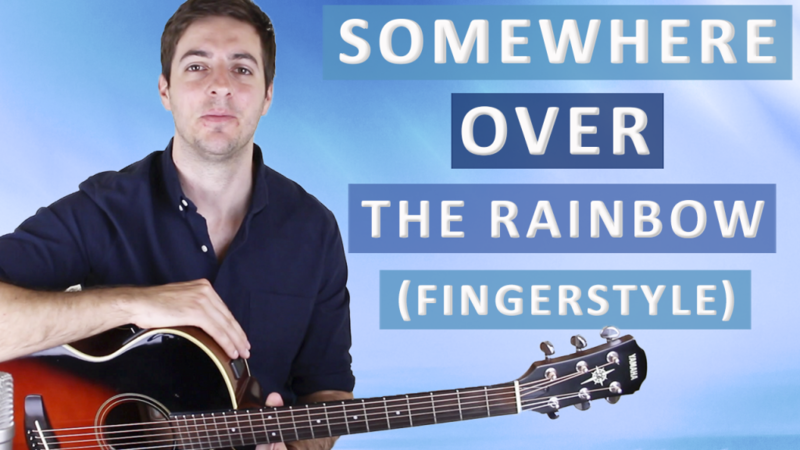 Scroll down for full video lesson (with tab) of Somewhere Over The Rainbow. Somewhere Over The Rainbow was written by Yip Harburg and Harold Arlen in 1939 for the classic film 'The Wizard of Oz'. The song is a beautiful ballad and was sung by the starring actress of the film, Judy Garland. It quickly became Garland's signature song and an instant classic across the world, and it went on to win the 'Academy Award for Best Original Song'. I think you'll agree, it is quite something. This fingerstyle arrangement isn't too difficult to play. If you compare it to Tommy Emmanuel's highly technical cover it really is a walk in park; however, depending on what level you're at with your own playing it may well still be a challenge for you. Somewhere Over The Rainbow is no. 29 on my Top 60 Fingerpicking Songs of ALL TIME list. If you've not seen the list be sure to check it out and sign up to my weekly email lesson so you don't miss learning any of these great fingerstyle songs. The key thing to focus on when doing any fingerstyle arrangement is the melody. The melody is by far the most important part, and it needs to be played as if it were being sung. The chords are of course incredibly important too, but there are no strict rules with what notes you need to play for them. If you don't like some of the notes I've picked for the chords and you feel it works better played in other ways, then by all means go ahead and change them. This is a really stripped down (not many thrills) version, so there is plenty of room for you to have some fun and add some extra colour here and there. If you want to make sure that you're really on the right track with fingerpicking, then perhaps try one of my fingerstyle guitar courses - find out more here. I do not speak English, but I am interested in scores of the video that you uploaded from the 10 songs of The Beatles, I await your response, thanks and regards. Hi, eventually I may get time to do that but all my focus is currently on creating content for this site. There are many scores of all Beatles songs online though.